The Buffalo Niagara Brewers Association (BNBA) and the Buffalo Bisons today announced an agreement where the Bisons’ Pettibones Grille will manage the BNBA’s annual festivals and events for 2015 and 2016. The new partnership will begin with the 2nd annual Buffalo Brewers Festival at Canalside on Saturday, June 20. In teaming up with the Bisons, the BNBA will benefit from the logistical and event management capabilities of the Buffalo Bisons and their Pettibones Grille staff. The Bisons have been a leader in the craft beer movement for years, showcased by the popularity of the team’s fridaynightbash!® Happy Hours and their annual Ballpark Brew Bash held at Coca-Cola Field. The BNBA and Bisons are currently preparing for the second annual Buffalo Brewers Festival at Canalside, a day-long event featuring more than 30 New York State breweries, local food vendors and live entertainment. For more information about the Festival at Canalside, please visit http://buffalobrewersfestival.com. Among the events being planned for 2016 include a winter festival and the first Annual Canadian International Brewers Festival tentatively planned in Niagara Falls, NY. The BNBA and Bisons will toast their new partnership with a VIP craft beer tasting event on Saturday, March 28 at Pettibones Grille and Catering Center at Coca-Cola Field. Attendees will receive two tickets to a Bisons game of their choice and two tickets for complimentary beer at the Consumer’s Craft Corner while attending the game. Tickets are $75 with over 25 hard-to-find beers including Canadian Breakfast Stout. Full food stations are included as well. For more information about the Association including membership please visit http://buffaloniagarabrewersassociation.org. The 2nd Annual Buffalo Brewers Festival at Canalside will take place this year on the afternoon and evening of June 20 2015. Expect another great festival with most of the same features as the 2014 festival: 30+ awesome NYS Brewers, mouthwatering food offerings, Meet the Brewer food and beer pairings seminars, and an epic Farm to Table VIP tent. Check back here frequently for updates. 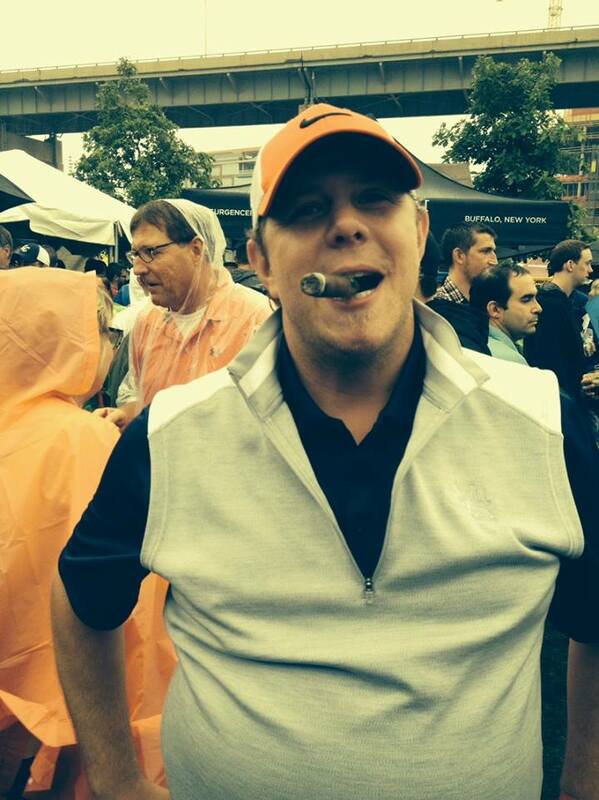 Last weekend the rains poured down like the beer from the taps at Canalside. What I mean to say is that it didn’t stop for hours. HOURS!!!!! Well rain be damned, Josh and Rebecca accompanied me down to the Buffalo Brewers Festival put on by theBuffalo/Niagara Brewers Association. When it was all said and done with, I was soaked and maybe a little more tipsy than I would have liked. No worries; Rebecca served as our designated driver! However, the rain really didn’t bother me all that much. By the time we left the Buffalo Brewers Festival, I had tasted at least 35 different types of beer. So that rain hadn’t stopped me or the more than 1,500 Buffalonians who attended from having a good time. While the weather was terrible, the beer was fantastic with over 80 different selections to choose from. Brewers large and small came to Canalside, such as Brooklyn, Ommegang, Flying Bison, Community Beer Works, Hamburg, Resurgence, and Rogers Beer just to name a few. Some smaller breweries brought one or two kegs of beer to sample, while some of the larger breweries brought three or four kegs and switched out when the keg was tapped. There was a VIP tent that opened at 2 PM, which had private tastings and a pig roast as well as comfy seating. Live music played most of the time with a tent set up in the middle of Canalside with bales of hay and tables to enjoy food. There were, of course, food trucks. The Whole Hog, and The Cheesy Chick, as well as Pizza Plant and JD’s Smokin Grill and Bars and a few others served up awesomeness, and coupled with all the fantastic beer, made the event a total success. The Tinder Box was even there selling cigars, which I was happy to sample. The real star of this show was the beer! I will point out that I’m not a huge fan of IPAs (just a little too hoppy for me, but too each their own). Some of the IPAs had me going back for seconds! Shmaltz Brewing Companies – “Death Of A Contract Brewer” was a Malty IPA, with hints of chocolate and coffee that got my taste buds ready for more beer. Hamburg Brewing Companies – “SamuRYE” felt like a stiff kick to the face. Full and hoppy and in your face like Bruce Lee! Keuka Lake Brewers – “Imperial Amber Rye Ale” was by far one of the best beers I tasted with it’s flavors more subtle than an aggressive IPA. It had me going back for thirds! My favorite beers are generally very heavy or very light; I’m not much of an in between kinda guy. Some of the porters and stouts were mind-blowing! Rogers Beers out of Rochester had a “Double Chocolate Porter” that tasted like a chocolate parfait in your mouth! Galaxy Brewing Company had a “Vanilla Porter” that was my favorite beer of the day hands down! Keuka Lake also had a “Saison Noir” that was to die for, which had some citrus flavor coupled with a much fuller flavor than I would have thought. It was a favorite of some of the Brewers as well! SingleCut Brewsmiths “Kim” was a Hibiscus Sour Lager that tasted as if you had stuck a hand full of sour gummies in your mouth! Pucker Up! At a tasting with beer event that featured foods by Premier Gourmet and chocolates by Ben Johnson of Blue Table Chocolates, the samples were paired up with brewers who selected beers to fit the flavor profile of the food. By far, the best pairing was a dark chocolate truffle with Resurgence Brewery’s Loganberry Wit, which–when paired together–drew all the raspberry and blackberry flavors from the beer as you ate the chocolate. It was to die for! Brewers then were available to answer questions and generally talked beer when they could with the patrons! 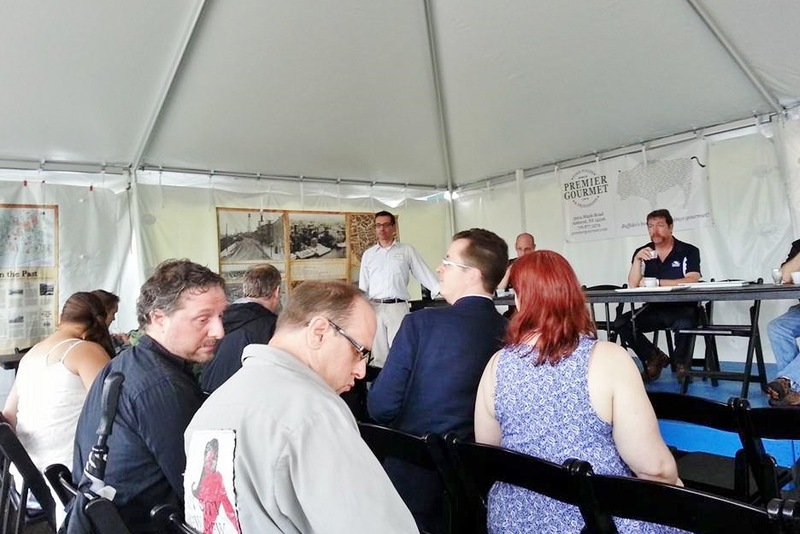 This festival, the first of what is set to become an annual event, was there to highlight all the great things going on in Buffalo as it comes to food, brewing and sustainability. Willard Brooks, president of the Brewers Association, told me that more events are coming up this year; Buffalo’s 5th Buffalo Beer Week 2014! The events are helping to showcase a Buffalo the likes of which we haven’t seen in years–confident, full of fun, and ready to believe good things are ahead! 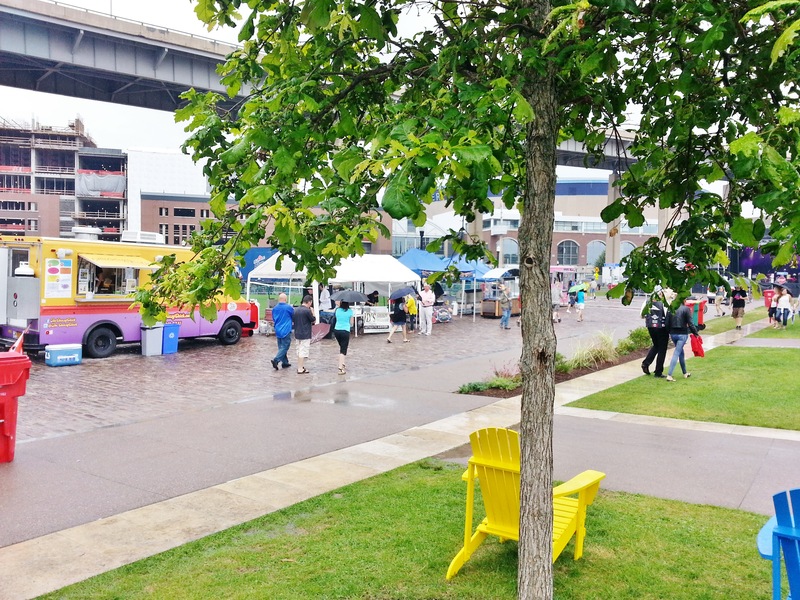 Crowds came out to Canalside on Saturday in spite of rain for the first Brewer’s Festival to sample beer from 30 New York brewers and dine on food truck fare. As the festival began Saturday afternoon, music played and so many people stood by the beer tents with small tasting glasses, and umbrellas, that the taps and servers were obscured. As the first event organized by the newly formed Buffalo Niagara Brewers Association, the festival attracted beer aficionados, music fans and foodies. About 1,000 sprang for advance tickets, from a $40 regular entry and tasting glass to $75 VIP passes. Niki Klem went for the VIP ticket because it came with a tasting of pork dishes made with meat raised at T-Meadow Farm in Lockport. “There’s a neat Rust Belt artisan food and drink revival,” she said. Klem usually prefers wine, but the sour taste of the pale beer in her glass pleased her. Tania Klemm and friend Sarah Hulings lounged in Adirondack chairs sheltered from the rain beneath the Skyway overpass. They came from Erie, Pa., to hang out and hear the blues and jazz of the headline act J.J. Grey & Mofro. Klem liked the Andromeda IPA beer she tried by the Binghamtom Galaxy Brewing Co. The wet weather wasn’t getting in the way of her fun. Inside the VIP tent, Noah McIntee, the brewer at Pearl Street Grill & Brewery, was trying a Session ale by Flying Bison. It was a perfect pallet cleanser – light, hoppy and refreshing. He was standing next to Lockport T-Meadow Farm owner Rich Tilyou. Both were waiting in line to sample pasta Bolognese with pork and bison and other dishes made with T-Meadow pork raised on grain leftover from beer making. Pearl Street was one of two breweries sending from 4,000 to 6,000 pounds of spent grain a week to help feed T-Meadow’s 150 heritage breed hogs. A premiere craft beer festival featuring over 30 New York State breweries, roots and rock music, local food vendors and brands and celebrating the spirit of Buffalo. The Buffalo Brewers Festival is committed to a message of sustainability and supporting local brewers, local farmers, local chefs and local business. WNY’s Only Craft Beer Festival Put On By and For WNY Brewers! Buffalo, NY – The Buffalo Niagara Brewers Association announced last week at a Canalside press conference that tickets are now on sale for the Buffalo Brewers Festival at Canalside, a premiere craft beer and music festival on Saturday July 19 from 3-10pm that will celebrate and showcase Western New York’s burgeoning craft beer and food scene. The festival, which runs from 3pm-10pm, will convene the area’s top local & state brewers, farmers and food artisans for a day-long festival that will include craft beer tastings and pairings, live music, food trucks, and much more. The Buffalo Brewers Festival will feature craft brewers and brews from more than 30 New York State breweries, six live bands on two different stages, five food trucks, and a Meet-the-Brewer tent with brewer-led food/beer pairings, educational panels, and special tastings. BEER! – We will be hosting 30+ breweries with 60 or 70 different beers on tap to sample. Later from 7-10pm, while J.J. Grey & Mofro is playing, we will have pints for sale featuring only BNBA member breweries. Check back often at BuffaloBrewersFestival.com and BuffaloNiagaraBrewersAssociation.org for the beer list as it evolves. Meet the Brewer Tent – Special ticketed food & beer tasting sessions on topics such as local brewing history; pairing beer with cheese, charcuterie, and chocolate; local cider; and local malt and hop farming. VIP Tent – Available to VIP-ticketed guests, the beer tent is a beer-enthusiast and localavores’s dream, serving up select special brews paired with a whole-roasted hertiage hog from T-Meadow Farm and an array of locally crafted sides — all expertly prepared and presented by Chef Jeff Cooke of Osteria 166 and students from the ECC Culinary Arts program. Two Music Stages – Thanks to Canalside’s talents, live music will be part of the festival all day long! During the beer tasting from 3-7pm, music will complement the 30+ breweries on tap. Later from 7-10pm, the music will take center stage as J.J. Grey & Mofro play southern rock and blues with pints of beer for sale at the beer tent, featuring only local member breweries of the Buffalo Niagara Brewers Association. Breweries — So far: Community Beer Works, Ellicottville Brewing Co., Flying Bison Brewing Co., Gordon Biersch, Hamburg Brewing Co., New Buffalo Brewing Co., Old First Ward Brewing Co., Pan Am Grill & Brewery, Pearl Street Grill & Brewery, Resurgence Brewing Co., Ringside Beer, Southern Tier Brewing Co., Woodcock Brothers Brewing Co., Schmaltz Brewing Co., St Lawerence Brewing Co., Barrier Brewing Co., and Single Cut Beersmiths. Check the website frequently as more breweries are added. Tickets are now on sale and can be purchased at www.TicketFly.com or the Association’s website, BuffaloNiagaraBrewersAssociation.org. General admission is $40 and includes all beer tastings and access to live music from 3-10pm. VIP tickets are also available for $75 and include early entry and access to the VIP tent. For more information about the Buffalo Niagara Brewers Association – including membership – and the full line up of bands, breweries, food vendors, and other participants, please visit BuffaloNiagaraBrewersAssociation.org. Also visit BuffaloBrewersFestival.com. Tickets available at the Buffalo Bisons box office, at all Consumers Beverages, or by clicking BUY below.